Gill’s love of horses started early and she and has now been riding for more than 40 years. She began eventing in 1978 and has competed in affiliated eventing, dressage and show jumping. 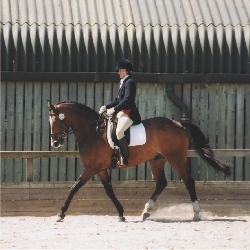 Gill’s most successful horse – The Rum Tum Tugger – competed up to 4 star level including Badminton, Blenheim, Chatsworth, Bramham and Windsor Three-Day events. Gill was fortunate to receive regular training from top trainers – including Andrew Murphy, Ernest Dillon, Sally Thurloway and Yogi Breisner – and has herself also instructed at all levels up to combinations competing in Intermediate eventing and Elementary dressage. Actively involved with riding clubs since 1978, Gill has also competed in numerous riding club teams in eventing, show jumping and dressage and has organised an unaffiliated Two-Day event and designed a course for an Eventers Challenge. Gill is also a regular sponsor of B.E. events, local riding club, pony club and charity competitions and shows. Gill has now ‘retired’ from active competition to support her daughter who is currently enjoying Pony Club eventing. Gill also gives talks and lectures on the use of chiropractic techniques to treat animals to a variety of local clubs and groups. Gill’s experience over many years riding a variety of horses – young and old, her own and those of other owners – has provided her with a deep appreciation and first-hand knowledge of the many types of problems encountered by owners and riders.